Preheat oven to 350°F and spray 2 (8 inch) round cake pans with cooking spray. With an electric mixer, beat cake mix, eggs, oil, water, and sour cream on low until combined. Beat on high for 2 minutes. 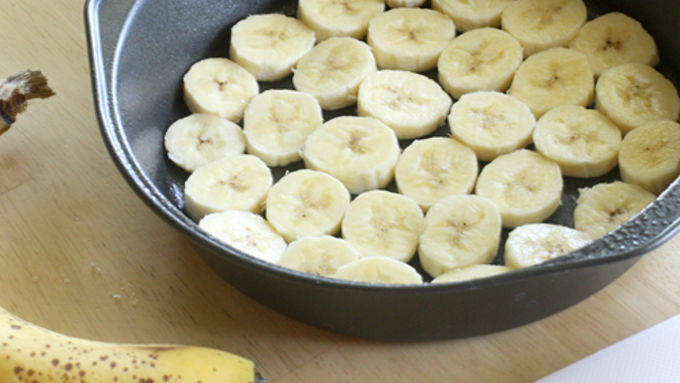 Place banana slices evenly on the bottom of the two cake pans. In a small saucepan melt butter. Add brown sugar and lemon juice and heat until dissolved. 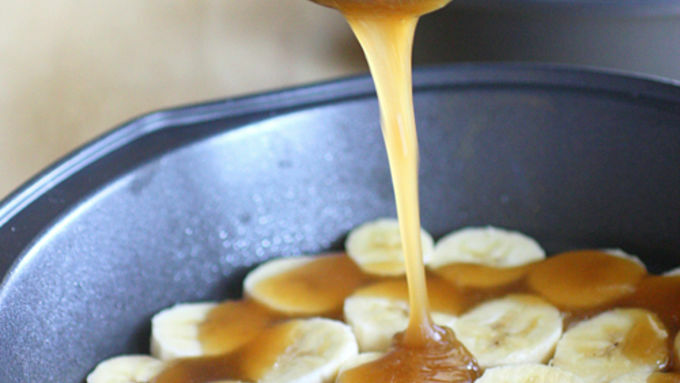 Pour half of the brown sugar mixture into each of the 2 round cake pans over the bananas. Sprinkle coconut over brown sugar sauce, and then pour cake batter on top of the coconut into the two pans, dividing equally. Bake 35-40 minutes or until toothpick in the center comes out clean. Remove from oven and let sit for 5 minutes. Invert onto serving dishes. Slice to serve. You know a dessert is good when you literally have to take the fork out of your husband’s hand to stop him from eating the entire cake. “This is dangerously good,” he mumbled through a mouth full of warm cake. Well folks… looks like we have a winner! 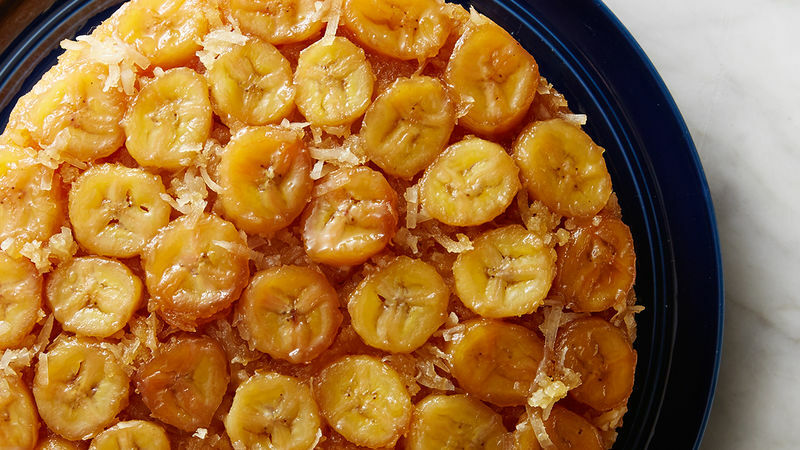 This Banana Coconut Upside Down Cake has a layer of bananas and coconut with a brown sugar sauce infusing every bite. Technically this is a dessert but for some reason, probably because bananas are involved, I know I’ll find a way to serve it up for breakfast or brunch. The great thing about it is that it only takes minutes to assemble but appears like you spent all day on it. My first thought when I was making this cake was, “Wait a second. Don’t we need frosting?” Oh no. 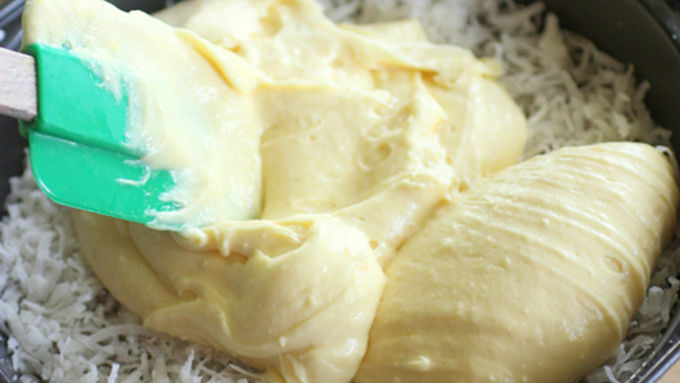 By adding this brown sugar mixture, a frosting-like layer is created that oozes in between the bananas and coconut while baking. When it comes out of the oven just try to stop yourself from digging in right away!